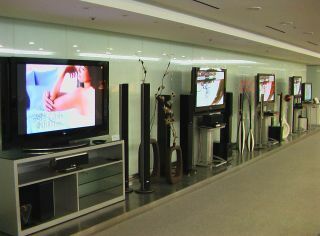 LG Philips demonstrated its first LED back-lit LCD TV at an international technology conference in South Korea last week. The unnamed 47-inch TV boasts 1080p image resolution, can display 1.07 billion colours and has a claimed contrast ratio of 1,000,000:1 - a number we'd very much like to see proven. It also has an eight milisecond response rate and 500cd/m2 brightness. LEDs are said to provide a whiter light for LED backlighting than current fluorescent-lit technology. This promises more natural colour tones and brighter images in future LCD TV panels. Rival TV maker Samsung released its first LED backlit panels last year.